The last few days have been a little different than I expected...but then again, what's new! That's so often how life is! 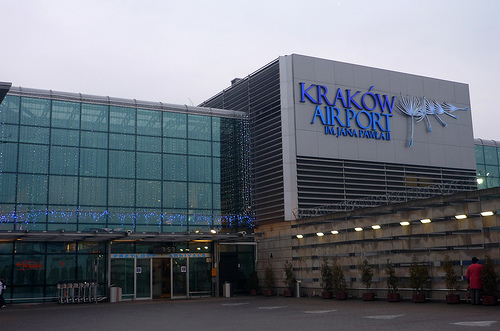 Dave and I traveled together to the Krakow airport very early on Monday morning, where I dropped him off for his flight to Estonia, and then had three hours before I had to be back at the airport for my flight to the States. After heading to a mall in town to kill time, I got back to the airport, parked the car in the outer lot to save money (Dave's request! ), lugged my suitcase into the airport and headed for the Lufthansa check-in counter. When I handed over my passport so the ticket agent could look up my reservation, I had no idea what he was about to say. "Ma'am, your flight has been cancelled. The plane never arrived from Munich. You'll need to go over to the Lufthansa office and have your ticket changed." WHAT?? That was a bit of shocking news! I asked if there was another flight going today, to which he replied with a serious face, "You'll need to go over and be re-booked." Hmmm...didn't sound promising. Long story short...there were no more flights out of Krakow that day. The agent worked with me for a half hour trying to find one but to no avail. The only option was to spend the night in Krakow and take another flight in the morning. After getting my ticket re-issued, I lugged the suitcase all the way back to the outer parking lot, got the car and headed to the hotel where I did indeed spend the night, compliments of Lufthansa airlines. At least that part was nice (as was the voucher for food!). I did get on the plane the next morning, and made it safely (after 26 hours of travel) to Portland, Oregon where my mom, dad and brother met me. After another two hour drive down to Eugene, I'm here in their house, having had a good night's sleep and now about to head out on my shopping adventure for the Malenovice cabins! Life is definitely an adventure! I can't believe you had it in you to post on your blog!!! Wow... Praying for you Mom!